Original Article by Straits Times published on 10th Aug 2017. Developer GuocoLand has trimmed the number of units put up for sale at its latest condominium, Martin Modern, in what is seen as a bet on private residential prices reversing course after years of decline. Other developers also appear to share the same sentiments. Earlier this week, Chinese developer Qingjian Realty said it is holding back the second phase of sales launch at its Le Quest project in anticipation of possible upturn in the property market. Lendlease had also put off placing new units at Park Place Residences at PLQ on the market after launching 217 apartments for sale in March – in the hope of pricing the remaining units at a higher price subsequently. GuocoLand told The Straits Times that it sold 110 of the 450 units at luxury condo Martin Modern in Martin Place within about two weeks of its launch last month. The developer said there is potential to raise the selling price next year. “We have already started to moderate the releases… You want to achieve a good start so there is confidence in the project. I think we have already achieved that. We should not be selling too much too fast,” said Mr Cheng Hsing Yao, group managing director of GuocoLand (Singapore). Average selling prices at Martin Modern, the first major launch in the Robertson Quay neighbourhood in eight years, range from $2,009 psf to over $2,500 psf. Mr Cheng declined to speculate by how much the prices might rise next year but he acknowledged there will be “pressure for prices to go up” in view of recent aggressive land bids and fewer condo completions. GuocoLand is seeking opportunities to acquire plots, with a focus on mixed development as well as good-quality sites for homes. However, Mr Cheng said the firm will “keep a level head” on land bids. The developer has three other projects with unsold units: the ultra luxe Wallich Residence at Tanjong Pagar Centre, Leedon Residence off Farrer Road and Sims Urban Oasis in Aljunied. The 99-year leasehold Wallich Residence, which will be ready in the fourth quarter, is spread across levels 39 to 64 in Singapore’s tallest building. The project caught the public eye recently after news broke of its $108 million super penthouse. Mr Cheng said 19 apartments at the 181-unit luxury condo project have been sold at an average price of $3,100 psf. The 21,108 sq ft super penthouse is not ready for sale. The Straits Times understands that the super penthouse, spanning three floors, will have a dedicated lift and is highly customisable. Below the Wallich Residence sits 890,000 sq ft of Grade A office space, Guoco Tower, of which 93 per cent has been leased. The firm is in talks to lease the remaining office space, including 27,000 sq ft on level 37, at higher rents. Property consultants have been forecasting a bottoming out of rents in the commercial property market this year as sentiment improves. “A lot of the tenants at Guoco Tower are MNCs with regional headquarters here, and they are growing. Less than a year into moving here, five tenants are already expanding,” said Mr Cheng. About 40 per cent of tenants at Guoco Tower are in the technology, media and telecoms sectors, and they include Uber and Agoda. A version of this article appeared in the print edition of The Straits Times on August 10, 2017, with the headline ‘GuocoLand looks to rise in private home prices’. Print Edition. Original Article from Business Times published on 24th Jul 2017 by Angela Tan. GUOCOLAND said on Monday that the first phase of Martin Modern has been sold out after close to 90 units were snapped up during the launch over the weekend. The Singapore developer had initially planned to launch between 50 and 60 units. The units sold ranged from two to four-bedrooms, from S$2,009 per square foot (psf) to more than S$2,500 psf. The value of the apartments ranged from S$1.75 million to S$4.55 million. The total value of all apartments sold during the past weekend was more than S$220 million, GuocoLand said. Martin Modern is expected to receive its temporary occupation permit by end 2021. Original Article from theedgeproperty.com.sg published on 7th July 2017. Singapore-listed property developer GuocoLand is set to preview its latest luxury condominium, the 450-unit Martin Modern on the weekend of July 8 and 9. It will be the first major launch of a condo project in Martin Place in over nine years — since the 302-unit Martin Place Residences next door was first rolled out in 2008. It will also mark the first launch of a luxury condo in 2017. GuocoLand had upstaged 12 other bidders to win the 99-year leasehold site in a government land tender with a top bid of $595.1 million, or $1,239 psf per plot ratio (ppr) a year ago. At that time, many had considered GuocoLand’s bid aggressive. “Now, one year on, it doesn’t look so expensive,” says Cheng Hsing Yao, group managing director of GuocoLand Singapore. The developer’s confidence in the site stems from the sales it had continued to garner at two of its luxury condo developments: the 210-unit, freehold Goodwood Residence on Bukit Timah Road; and the 381-unit, freehold Leedon Residence, off Holland and Farrer Roads. These strong sales were achieved against a backdrop of lacklustre sales in the rest of the luxury condo segment last year. “What that showed us was that if you make the best use of a site to create a product that people like, demand will be strong regardless of the state of the overall market,” says Cheng. The other reason for GuocoLand’s confidence was that there are very few state land sites in the prime neighbourhood. The last Government Land Sales (GLS) site sold in the Robertson Quay neighbourhood was in March 2011. That was when City Developments (CDL) paid $938 psf ppr for the site that has since been developed into the 70-unit UP@Robertson Quay and the adjacent 293-room M Social Hotel. Can Singapore’s prime District 9, a highly sought-after address for the well-heeled, still offer upside for home buyers? Unknown to some, the answer may be found within the River Valley and Robertson Quay precincts, where a slew of catalytic changes happening in and around it are seen stroking property prices northwards. Favoured for its central location and proximity to Orchard Road, the CBD and lifestyle amenities, this affluent residential enclave will soon enjoy greater connectivity with the completion of two upcoming MRT stations serving the River Valley precinct for the first time. Fresh lifestyle amenities including new hotels, retail and F&B offerings in the nearby Robertson Quay are also breathing new life into the waterfront promenade of the historic Singapore River. Their impact on property prices is imminent, some market watchers point out. “Increased connectivity and new amenities in the precinct would refresh both price and rents by lifting them to a higher plane,” says Savills Singapore research head Alan Cheong. He expects property prices in the River Valley precinct to rise over the next five years, while rents may turn around later this year and trend up over the same period. Such potential upside has not been priced into residential properties there yet, going by studies revealing that properties tend to command a premium when a new MRT line is completed. A study on properties near the Circle Line by professors from the Department of Real Estate at the National University of Singapore found that the new Circle Line opening created an estimated S$1.23 billion housing wealth effects for households living in close proximity to the MRT stations. Homes located within a 400-metre radius from the closest MRT stations enjoy an average price premium of 13.2 per cent relative to those outside the 400-metre boundary, the study shows. One project that has thus found itself in a sweet spot is Martin Modern, located in the upscale residential enclave at Robertson Quay. Sitting on a generous 1.6-ha site in Martin Place, the 450-unit condominium project is the latest luxury project by Singapore- listed developer GuocoLand Limited that is slated for launch in the second half of this year. It will be within walking distance to the Great World City station along the Thomson-East Coast Line and the Fort Canning MRT along the Downtown Line — both up and running by the time the project is completed around 2021. Mr Cheong believes that the completion of the Great World MRT station will further augment the popularity of this area, which is currently not served by any MRT lines but is still popular among expatriates. Few prime-district residential sites have come onto the market through state tender, with this site being the third in District 9 to be made available in the past 10 years. GuocoLand Singapore group managing director Cheng Hsing Yao says: “The site is in a posh residential neighbourhood that is also near the F&B cluster along Robertson Quay, and a short walk from the future Great World MRT Station on the Thomson-East Coast Line which will take residents straight to the CBD and Marina Bay. “A site of this size in District 9 is very rare,” he continues. “Its land area and high ground are ideal conditions for us to create our trademark luxury design as seen in Goodwood Residence and Leedon Residence.” Over 80 per cent of the land area at Martin Modern is reserved for a botanic garden, an arboretum of more than 200 plant species and over 50 species of trees and palms. The vast acreage will feature 15 different spaces including a party lawn, forest trail, rain gardens and a green maze. This garden is spread across three levels, leveraging the site’s 10-metre upward slope from one end to the other. Owing to its location, the project encapsulates both the tranquillity of luxury living and the convenience of lifestyle amenities well within reach in the nearby Orchard, Robertson Quay and Clarke Quay. The downtown core, Singapore’s business epicentre, is about five minutes’ away by car and less than 10 minutes by train or cycling. River taxi services at the Singapore River offer a unique daily ritual for those who love a boat ride to start or end their day. The nearby Singapore River promenade, Fort Canning Park and Alexandra Park Connector provide other work-out avenues for cycling enthusiasts. A number of yoga, pilates and fitness studios have also sprung up in the vicinity. Article from Straits Times Published on 25 Apr 2017. Written by Wong Siew Yin. Two prime condominium projects are slated to hit the market in the second half of the year amid a significant pick-up in new private homes sales recently. Analysts say the District 9 projects – GuocoLand Group’s Martin Modern and New Futura by City Developments (CDL) – are likely to interest local and foreign buyers if developers can price the units “correctly”. Cushman and Wakefield research director Christine Li believes Martin Modern will be well-received, “as the high-end residential market seems to be bottoming”. Non-landed private home prices in the core central region were down 10.3 per cent as at March 31 from a peak in the first quarter of 2013. GuocoLand told The Straits Times yesterday that the 450-unit Martin Modern in Martin Place will comprise two- to four- bedroom apartments across two 30-storey towers are set in lush greenery. Condominiums Martin Modern and New Futura (above) are slated to hit the market in the second half of the year. More than 80 per cent of the land area will be turned into a “unique botanic garden” with over 200 species of plants and more than 50 species of trees and palms, it added. 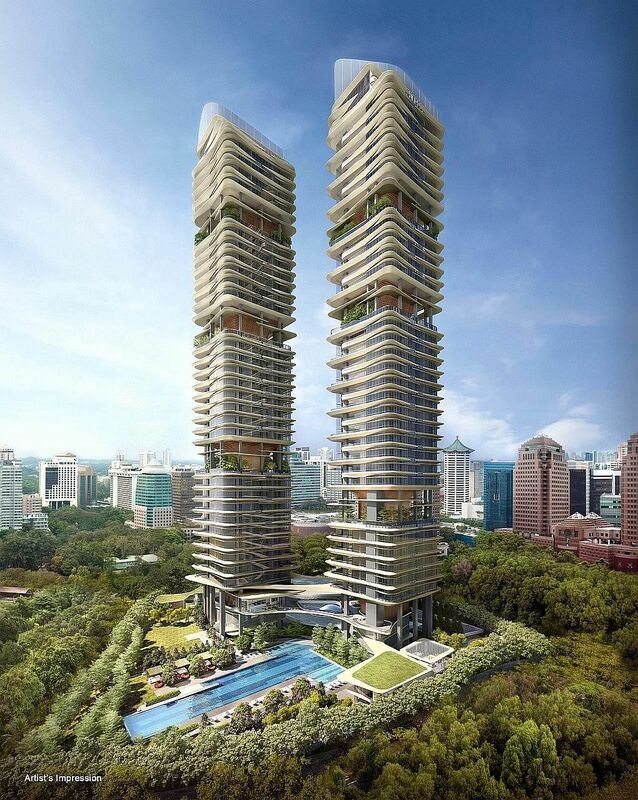 The developer said it is fairly confident about the 99-year leasehold project, partly owing to the recent robust sales at its Leedon Residence development. 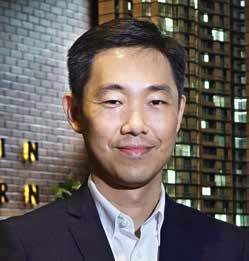 “We get a sense that many buyers here take a view that the high-end property segment offers very good value now,” noted Mr Cheng Hsing Yao, group managing director at GuocoLand Singapore. It moved 42 units with a total sales value of $250 million at Leedon Residence, off Farrer Road, in the first three months of the year. PropNex Realty, one of the agencies marketing the project, said the indicative average price for units at Martin Modern is about $2,300 per sq ft (psf). CDL said pricing for its freehold New Futura in Leonie Hill Road will be determined closer to the launch date. OrangeTee’s Mr Wong estimates that units could be priced at an average of $2,700 to $2,900 psf. “We believe it is due to the brighter economic prospects, as shown in strong manufacturing and trade growth since the fourth quarter of 2016,” said Ms Tricia Song, research head at Colliers International, Singapore. There were 3,141 new private homes sold in the first quarter, more than double the 1,419 moved a year before. Singapore, 24 April 2017 – The GuocoLand Limited Group (“GuocoLand”) today unveiled preliminary details of its latest luxury residential condominium project, Martin Modern in District 9, which is targeted for launch in the second half of 2017. Martin Modern is located at the corner of Martin Place and River Valley Close, within the posh residential neighbourhood of Robertson Quay. (See Annex 1 for location map). Besides its expansive garden concept, Martin Modern will also have bespoke recreational facilities and GuocoLand’s concierge services. The overall feel will be that of a plush and relaxed resort within the city centre. Group Berhad in Eco World International Berhad. As a premier regional property company, GuocoLand is focused on achieving scalability, sustainability and growth in its core markets through its property development, investment and management businesses.